In 2005/6, Best Buy, the leading electronics retailer introduced a unique program developed by its employees called ROWE. 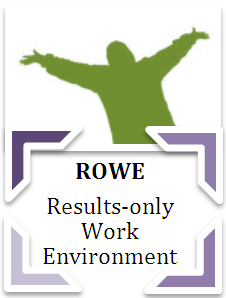 ROWE stands for “results-only work environment” and the goal of the corporate culture initiative was simple – judge performance based on output not on the number of hours spent at the office. Traditionally, many HR departments in companies viewed consistent attendance at office as good productivity. ROWE on the other hand allowed employees to make their own work-life decisions. Best Buy’s idea was not original in the sense that a few other companies like IBM and AT&T were already practicing the concept of allowing employees to work anywhere they want. However, Best Buy transformed its culture radically, practiced it more passionately and made the practice more rampant. The CEO, Brad Anderson even formed a subsidiary CultureRx to sign in other companies. Work no longer a place to go. Work is something to be done. Performance would be based on output, not hours. In 2003, two Best Buy HR employees – Jody Thompson and Cali Ressler came together to introduce the idea quietly. They agreed that a top-down approach would not work. The strict work@office regimen, meetings etc. at Best Buy were increasing employee stress levels and hindering the expansion of the company. They convinced two managers to join the experiment. The two managers then took meetings on boat trips or biking trips. There were no scheduled or mandatory meetings, performance appraisal was based on output instead of time put in and ROWE participants did not have to be physically in office. The idea soon spread in various employee circles and to the top management. Traditional managers were critical and did not understand how working while holidaying would solve the work life balance. However, ROWE spread across the company and eventually the CEO was informed on the 13 commandments of the ROWE campaign. By 2008, all headquarters employees (around 4,000) were working in ROWE. It’s O.K. to take a nap on a Tuesday afternoon, grocery shop on Wednesday morning, or catch a movie on Thursday afternoon. The results were amazing. In some departments that switched to ROWE, productivity rose by an average of 35% and voluntary turnover decreased by 52-90%. Today, some other ROWE approved companies include GAP, Banana Republic and ripple among many others.